Hello, everyone, from almost the far side of all the social activities that have been happening in Queensborough this spring. If you’re wondering why you haven’t heard from me in a while, the answer is simple: I’m pooped! Special Christmas activities, including seasonal lighting of the falls on the Black River. A farmers’ market featuring locally grown and raised foods. A bandshell for community entertainment events. Historical street signs for DeClair and Rockies roads. More plaques for historic buildings. More play areas for kids. Restoration of Queensborough’s baseball diamond so that we could host softball tournaments featuring teams from all the local hamlets. Is that not a great list? Next week the QCC Committee will be following up and talking about next steps, which ideas to proceed with, and so on. If you’re interesting in joining the committee and taking part in those discussions and plans for the future, you are welcome! We’re meeting at the community centre (the village’s former one-room schoolhouse), 1853 Queensborough Rd., at 7 p.m. on Monday, June 11. So there was all that. And then there was – drum roll, please – the Black Fly Shuffle! Half a century – it was worth the wait! This is the sign put up at the Orange Hall – the former Loyal Orange Lodge Branch 437 – by Jamie Grant (a talented graphic designer) to welcome Queensborough back inside one of its most important buildings for the Black Fly Shuffle. It was the first community event held in Queensborough’s historic former Orange Hall for close on half a century. And what an evening it was! The hall, looking terrific (and funky), even in its mid-renovation state, was filled with people of all ages enjoying old-time square dancing and also “round dancing” (by which I mean regular dancing; I’d never heard that term prior to the Shuffle, and perhaps you haven’t either, but now you know. You’re welcome) to two bands, Doug Pack and the Country Travellers and John Sedgwick (my brother!) and the ToneKats. It was just fantastic to watch the square dancers – both the veterans, who were amazing, and the rookies, who did their best to learn the moves – in action. And I don’t think it’s just sisterly pride when I say that my little brother’s band was terrific. Also, this being Queensborough, of course there was great food involved: halfway through the evening, at 10 p.m., there was the traditional (for old-time Queensborough dances) break of 15 or 20 minutes when everyone was able to load up their plates with sandwiches, cheese, cookies and other goodies that had been brought by all who came to the dance. It was delicious, and it was just the fuel we all needed for another round of energetic dancing, putting to the test the floor joists in the 146-year-old hall. Perhaps the best part of the evening was the stories. “We had our wedding dance here,” one person told me. “I met my husband at a dance in this hall,” said another; she and her husband recently celebrated their 65th wedding anniversary. A third told me that a community bridal shower had been held for her in the hall prior to her wedding, which was 60 years ago this past fall. Others spoke fondly about attending – or performing at – dances in the old Orange Hall back in the day, and reminisced about some of the shenanigans that were known to take place outside, in the darkness of a spring or summer evening. Hot times in little midcentury Queensborough! I cannot say enough about the husband-and-wife team of Jamie Grant and Tory Byers, who took a huge chance in buying the Orange Hall a year or so ago, have done an immense amount of work on cleaning it out and cleaning it up, have built a full stage and added a ton of whimsical touches, have lots more plans ahead – and basically threw open the doors and welcomed a whole community inside their building at the Black Fly Shuffle. It was a lovely, lovely night. A night to remember. Okay, well – have you caught your breath yet from all that activity? (And I haven’t even mentioned the 128th anniversary celebration at St. Andrew’s United Church, which happened this past Sunday, and was absolutely wonderful.) Now: guess what’s next! Really, you know, Queensborough is not just a happening community; it’s a caring community. And we know how to kick up our heels and have a good time. I cannot imagine a better place in all the world to be. Here at the Manse, we are so fortunate to be surrounded by a variety of trees, both on our own and our immediate neighbours’ properties. You all know that one, I’m sure – or at least some version of the first two lines. It came into my head this evening as I was downloading photos of the trees here at the Manse. The autumn foliage in the Queensborough area has in general been less than spectacular this year – probably due to the cool, wet summer and then the sudden burst of extreme heat just around the time the leaves had started to turn – but in the closing days of the foliage season some trees are looking pretty great. And one of these, I am happy to report, is the maple tree that Raymond and I proudly planted a few months after we bought the Manse 5½ years ago. Day 1 of our newly planted maple tree. It didn’t look like much then! Our beautiful maple tree (with the equally beautiful Tree of Life behind it to the right, across the street). As you can see, our maple tree has grown and flourished. And the fact that it’s a variety called Autumn Blaze means that it looks spectacular come September and October – more so, I think, this year than in any of its autumns past. So yes, poems may be lovely – but can they ever be as beautiful as a tree? That’s the question American poet Joyce Kilmer (“Joyce” in his case being a male name) asked (and answered in the negative) in his poem published in 1913 and memorized by countless schoolchildren since. That description of the Kilmers’ “well-wooded lawn” reminded me of what Raymond and I are fortunate enough to enjoy here at the Manse. As you can see from the photo at the top of this post, which I also took this afternoon, not only do we have our maple but also the elm tree that we planted post-Manse purchase (it’s in the right foreground of the photo; it’s lost almost all its leaves now, but has also grown and flourished beautifully in the five years since it was planted), as well as huge yet-to-be-identified (by me, at least) evergreens at the rear of the property (actually in our neighbour-to-the-west Julie’s yard, but we can enjoy their beauty too) and a beautiful birch (behind Raymond’s red truck) and quite a few colourful deciduous trees on the property of our neighbours to the south, Brian and Sylvia. The two huge spruce trees – Norway spruce, I believe – that tower over the northeast corner of the Manse. Yes indeed: a lot of cone-picking. This is how our lawn looks after two clean sweeps of the cones have already been made this season. And there are still hundreds left to fall! But despite our trees sometimes being work – as in picking up many lawn bags’ worth of cones, not to mention fallen leaves – I have to say I am always appreciative of their beauty, and of how much they contribute to our lives and landscape. Like Joyce Kilmer, I love living in the midst of a “well-wooded lawn.” Would I swap poems for trees? Let’s just say I’m happy I don’t have to. Here’s Joyce Kilmer’s sweet little poem in full. Everyone loves a good apple. But what kind is it? The first apple I picked from the apple tree that Raymond and I acquired when we bought the property next door to the Manse. This photo of it proved ever so popular on social media. Now comes the important question: what kind of apple is it? Anyway: despite the terrible drought that has gripped Eastern Ontario this summer, the trees in apple orchards really are bending down with fruit this September. Or actually – I can’t speak for the orchards, because I don’t know of any cultivated apple orchards around Queensborough. But the apple trees in people’s yards, and at the edges of farm fields and fence lines, and along the roadsides, are most certainly bending down with a bumper crop of fruit. Maybe drought is good for apple crops? Hard to imagine, but there sure are a lot of apples. The branches of our very own apple tree are laden with fruit. Gracious, the number of likes and comments that came in! From old friends and new, from all over Canada and the U.S. Perhaps it’s the season: late summer turning to fall, when apples are at their best and people are thinking about them. Perhaps it was a reminder for some of the childhood treat of picking and eating a just-ripe apple from your family’s tree, or that of a neighbour. Whatever the reason, I was inspired to carry on with the apple-tree theme for today’s instalment of Meanwhile, at the Manse. One of the nicest responses I had to posting the photo on social media was a reminiscence shared in person yesterday morning at church (St. Andrew’s United in Queensborough). A neighbour and friend said to me: “That apple tree – I remember walking under it on the way to school.” The tree stands on the edge of the property, alongside Queensborough Road and the narrow sidewalk along which generations of children once walked every day to and from classes at Queensborough’s one-room schoolhouse, which stands maybe a hundred yards west of the tree. The old one-room schoolhouse in Queensborough, now the Queensborough Community Centre. I will always regret missing – by just one year – the chance to attend that one-room schoolhouse; it was closed the summer before six-year-old me was to start school, which is why I ended up at much bigger and fancier (for those days) Madoc Township P.S. But regrets aside, I love the image of schoolchildren decades ago stopping to pick apples from the very tree that Raymond and I can now call ours. A view of the apple tree as a kid would see it walking home at the end of an early-fall schoolday. I would think those easy-to-reach apples would be pretty tempting. The house on the property next to the Manse, commonly called the Kincaid House after the family that lived there for many, many years. This beautiful picture is by Queensborough photographer Dave deLang. At the moment we use the house for storage, primarily of our large (to put it mildly) book collection. But someday, someday… a bookshop, maybe? But back to the apples. One question I got as a result of my apple-photo post on social media was what kind of apples they are. Wealthy was one suggestion, and I have to say I had never heard of that variety before. (I have since learned a bit more, thanks to various websites including this one from Maine, which says that the Wealthy “is considered to be a standout among pie apples.” Sadly, as my friends know, pie-making is not my forte.) Another suggestion was Northern Spy. My own first guess was McIntosh, since those are common around here, but my friend who remembered the tree from her Queensborough school days was doubtful about that. As this site (from an apple-growing outfit a bit southwest of Toronto) indicates, all three varieties are to be found in Ontario. But if you’ve ever looked through the criteria for discerning apple varieties (as Raymond did, when I posed the question to him of what our apples might be), you’ll find that the variables are many, and coming up with the right answer is pretty darn hard. So, readers, it’s your turn. Does anyone familiar with our Queensborough apple tree know what kind it is? Or are there any apple experts out there who can identify it from my photo? And hey, if you need a taste in order to come up with the answer: stop by and pick one yourself! You just have to reach over the fence – like many a schoolkid before you. People, I have got myself a bike! It’s something I’ve been wanting pretty much since Raymond and I bought the Manse four years ago – a way to get around Queensborough (and a little beyond) when I want to go quicker than on foot but without burning fossil fuels. My dream, much scoffed at by people who are more serious cyclists than I am (which is pretty much the entire world), was an old-fashioned bike with no gears to work, no cables running from handlebars to wheels, and brakes that you’d apply by cycling backwards. Also: a bike with a comfortable seat and that allowed you to sit up straight rather than hunkering down over the handlebars. A bike, in short, very like my first one. Which was the best gift ever from my parents, The Rev. Wendell and Lorna Sedgwick, when I was perhaps eight years old and growing up right here at the Manse in Queensborough. It is a Schwinn Cruiser, and while it looks (in my opinion) like a million bucks, the price was stunningly low. People, this gorgeous bike cost only $139! Now, granted, that’s $139 U.S., which at the current horrible exchange rate is about $3,500 Canadian – no, no, I’m kidding. The exchange rate is horrible, but still, I got this great-looking bike for considerably less than $200 Cdn. You can’t beat that with a stick. I had to laugh at myself as I wobbled around the Manse’s front yard a few times when I first got on it – just like the first time I got on that little CCM back in about 1968. (And don’t think I wasn’t missing my dad being there to keep me upright.) It had, I realized, been a long time since I’d been on a bike. But I got the hang of it once again, and have zipped around the block a few times since. I need to get a basket so that I can cart stuff – like a dozen farm-fresh eggs from Debbie the Queensborough egg lady, or bulletins to be delivered for the Sunday service at St. Andrew’s United Church – while I’m riding around on my retro turquoise two-wheeled wonder. But aside from that, I’m thrilled about my bike and the possibilities. Now I just have to work up the nerve to climb up that hill on the western edge of the village – and whip down it once again, after all these years. I hope the wind still whistles. I was startled to find, lying atop a pile of construction debris at the dump, a door that looked remarkably like the doors in the Manse. A sad end for a fine old thing. “These don’t go in the recycling,” the helpful attendant at the dump told me, holding up two wire hangers from the dry cleaners that I had tossed into the blue bin along with the tin cans, aluminum foil and hard plastics. “You have to take them to the bin for metal back there,” he said (not unkindly), gesturing with his head to the large section at the Municipality of Tweed dumpsite where you take your bagged garbage and also large items such as furniture and construction materials, which go into big dumpsters. I sighed a little bit, because it was a wet, overcast, muddy day, I was sick with a bad cough, and I really just wanted to get this dump excursion over with. Now I had to make a stop at the metals bin along with my recycling and garbage-bag stops. But in the end I was kind of glad he’d sent me there. Well, glad – and sad. Because in the construction-materials dumpster that was close to the metals dumpster, I spotted the nice old wooden door that you can see in my photo. It caught my eye because it is very similar to the old wooden doors still in use here at the Manse, and that I imagine date from the time when the house was built in 1888. The door of the bathroom at the Manse (formerly the minister’s study, we have it on good authority). As you can see, it’s a lot like the one I spotted in the dump. 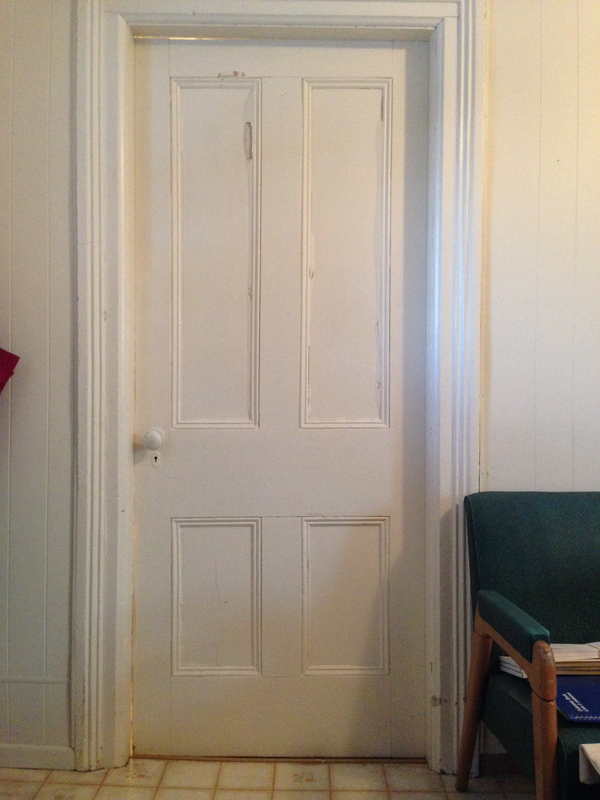 The front door of the Manse as it is today – modified and very much in need of repainting and general touchup, but still solid. 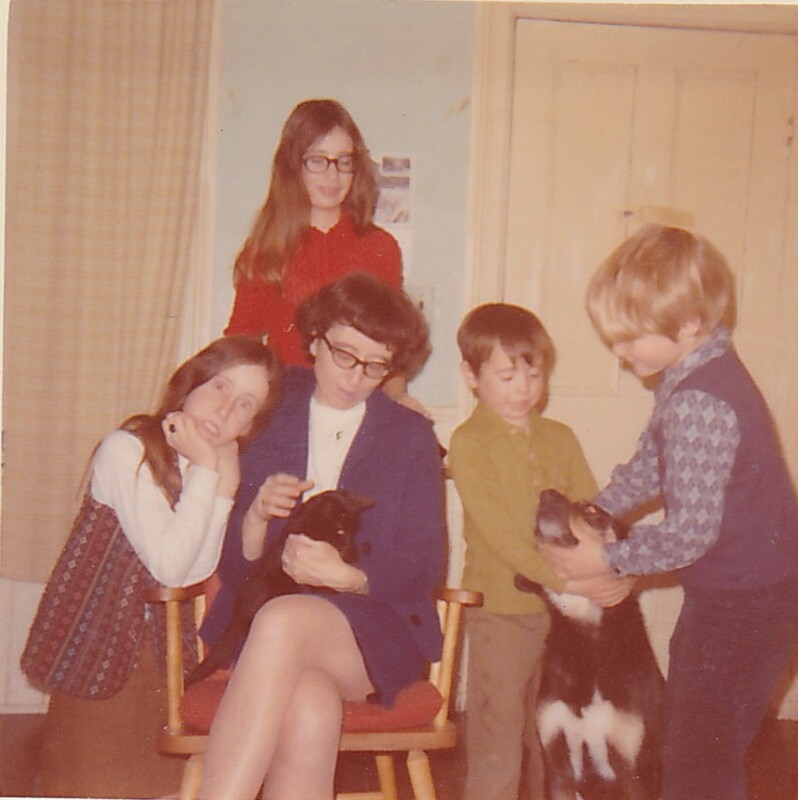 This c. 1971 photo of me and my family at the Manse (from left, my sister, Melanie, being a cutup as usual; me standing; my Mum with a cat whose name I’ve long forgotten; and my brothers Ken and John with Finnigan the not-very-bright dog) allows you to see (in the background at right) that the front door of the Manse was in its original state then, with no window in it. 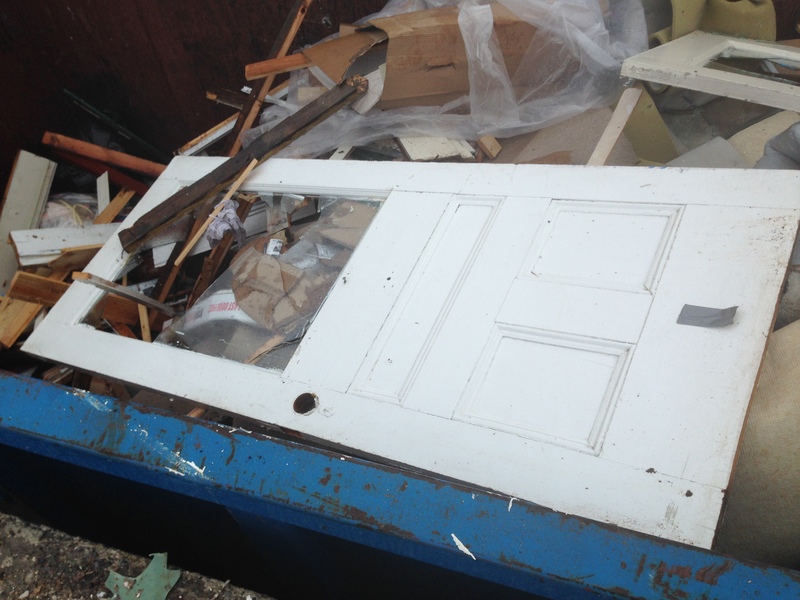 As with our front door, the top panels of the one at the dump had been cut out to make a window. 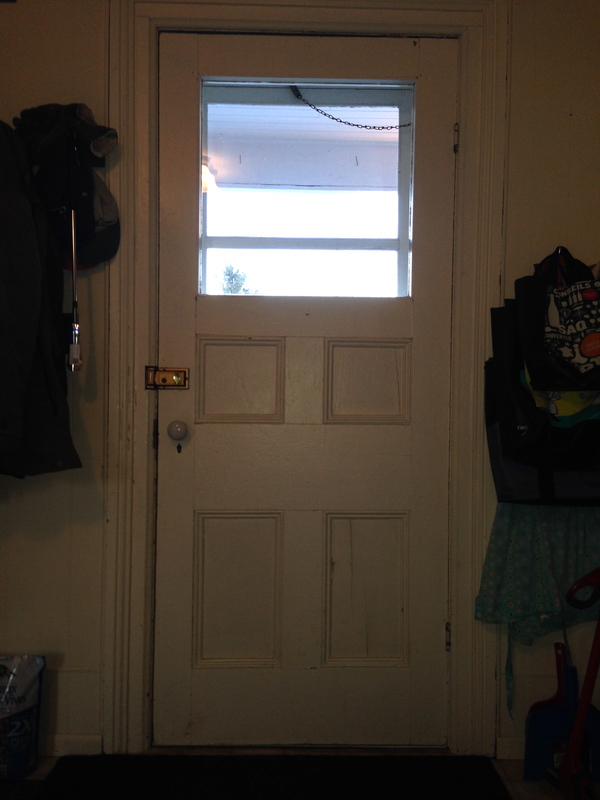 And also, it was very battered and worn – just like our doors are. But it was not so battered and worn that, after some stripping of old paint and touching up, it wouldn’t have looked quite splendid installed in a house of its period. And that’s why it made me sad to see it lying there in the dumpster. A good solid wooden door that had been made – probably locally – well over a century ago, featuring some nice detail, and that had served its intended purpose well for many, many years – now just tossed, to be forgotten and replaced with something that I’d be willing to bet won’t be nearly as nice or as sturdy, and won’t have been made by local craftspeople. Well – let me just say that if you ever go dumpster diving at the Tweed dump, I don’t think you’ll be finding any of the Manse’s doors.